The infamous storm of 1980 may have been one of the worst weather events in local history, but it brought out the best in Eau Claire’s people. 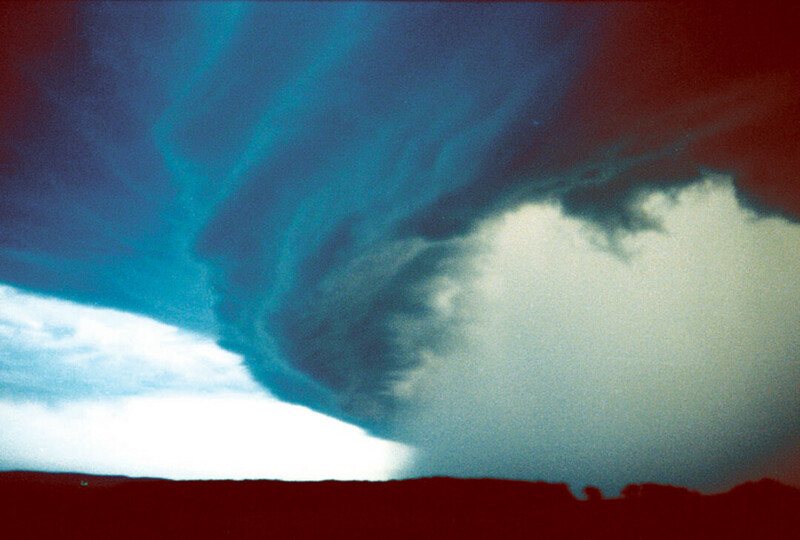 Wayne Thibado captured this photo of the windstorm as it approached Downsville on July 15, 1980. By 1980, radar technology had advanced sufficiently that local television stations could operate their own such machines. What used to be the realm of the military and the National Weather Service could now be erected where your TV weathermen did their jobs. That summer, one of these radars had been in use for a year behind Eau Claire’s WEAU-TV on Hastings Way, concealed under a white sphere on a short tower. With its primitive color display scheme – color weather radar was also a new concept – it displayed greens and reds, and if the rain was particularly heavy, some whites and blacks. 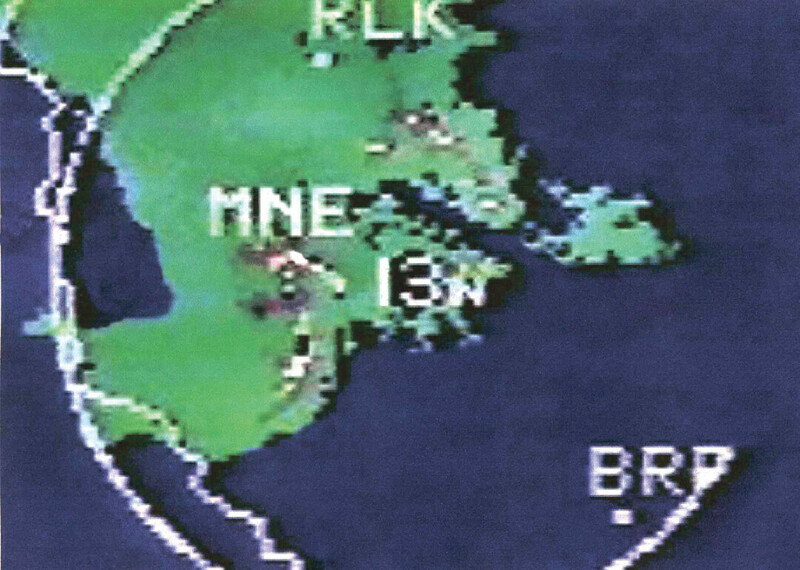 The evening of July 15, 1980, what was then called “NewsCenter Radar” showed a spectrum of these greens and reds appearing on the left-hand side of the screen, a classic signature of a thunderstorm. Then a new radar echo materialized: an image, in the shape of a bow – no, the winds were so intense, the bow was sharply pointed, like a spearhead. The whites and blacks were starting to dot the center of the system. At 9:39pm, the screen shut off. The Storm of 1980 had arrived. 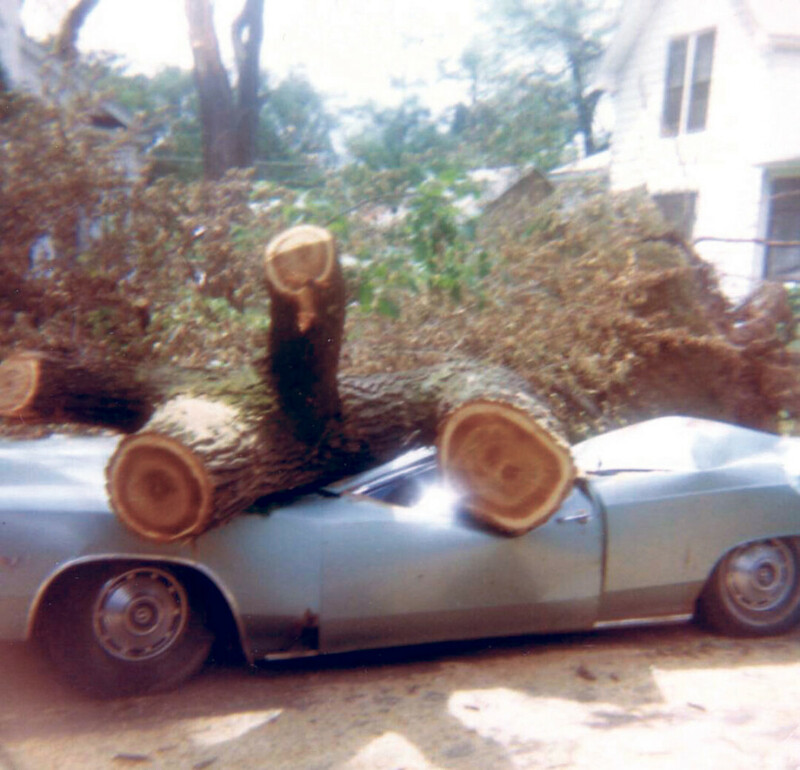 Fallen Timber wreaked havoc across the Chippewa Valley, crushing buildings and vehicles, such as this car photographed by Anna Stillman. This month marks the 35th anniversary of this event. Depending on your source, it is known as the Western Wisconsin Derecho (“derecho” being the meteorological term for what we experienced: a long-duration storm with strong straight-line gusts), or The Big Wind, or the aforementioned Storm of 1980. Regardless of the label, the intensity and damage resulted in what we can deem to be, with a fair degree of confidence, the most-significant weather event in Eau Claire and Chippewa Valley history. The Colfax tornado of 1957, the drought of ’88, the two-foot snow of December 2010 rank high as well … but when you mention the thunderstorm that brought triple-digit wind speeds to the region and caused at least $160 million in property damage, those who lived through it – like those who made and wore the “I Survived” storm shirts – will react viscerally. Maybe you do not remember the storm. The passage of 35 years means a couple of generations of Eau Claire-area residents – lifelong residents, even – were not yet born on that infamous day. Millenials, this is merely history to you. As a young Gen Xer, I was all of two years old that summer – about as young as a human being could be to realistically expect to remember the experience. Without knowing at the time – you know, being two and all – the storm established a personal fascination with severe weather; I almost chose a career path to become a TV meteorologist. At the very least, it inspired me to produce a book on the storm for its 25th anniversary, taking its title from that radar echo description we heard on WEAU: Spearhead Echo. If these are nothing but stories and pictures to you – or even if you were old enough but have moved to the Chippewa Valley in the years since – here is why this storm made such an impact in the Eau Claire collective. This vintage radar image from WEAU-TV shows the spearhead-shaped storm as it swept across the region. Entire sections of the city were left without power for approximately a week. The Eau Claire County Airport anemometer – a.k.a. the wind-speed gauge – broke due to the intense gales. 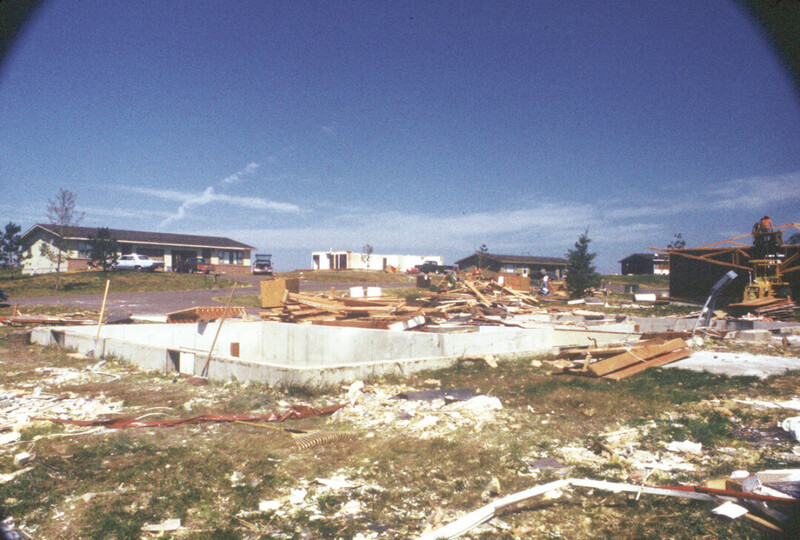 The Mill Run subdivision on the northwest side looked as though a tornado had ravaged the housing. When you enter the east side of Carson Park, note how the “Tree City USA” sign qualifies Eau Claire back to the early ’80s – the city lost its prior designation due to the immense number of downed trees, trees that left numerous roads impassible for days. Gov. Lee Dreyfus and President Jimmy Carter both weighed in on disaster aid. And we all got together for a mass city cookout – at least, it seemed that way. When conducting interviews for my book, a recurring theme was the spirit of camaraderie among those most-affected by the storm’s aftermath. Person after person would tell of how neighbors helped in whatever manner they could muster, figuring out ways to preserve or use their perishable foods while dealing with a lack of electricity for freezers amid the unrelenting heat of July. Grilling down the block was commonplace to cook meat before it could go bad, and many in the immediate vicinity would partake –this happened all across the city. That spirit of togetherness and community we all hope for in our society actually blossomed in the second half of that month. Gradually, the ever-present sound of chainsaws subsided, the brush was piled along boulevards, the power was restored – the workers from Northern States Power Co. (now Xcel Energy) made a Herculean effort to re-erect the lines – and our area became something like normal. Some scars remained: the occasional house that took months to restore and rebuild, the crops and farm buildings in Dunn County obliterated by the wind, the trees permanently bent by the gusts – some of which you can find to this day. Some scars were permanent: Two people were killed by the storm and countless others suffered the stress of its aftermath. Yet most scars healed, as most scars do – even early the morning after, the robins were singing, getting back to regular life. Duttee Holmes took this photo of a bare foundation in Eau Claire's Mill Run subdivision. Plenty of the same scars would be cut if another derecho – or a higher-caliber tornado – rammed the region. Normally, the Chippewa Valley doesn’t experience winds over 100 miles per hour, so we do not construct our buildings or plan our landscapes accordingly as we would if anticipating tornados in Oklahoma or hurricanes in Florida. Whichever city would get the brunt – maybe this time it would be Eau Claire’s south side, maybe Chippewa Falls, maybe Menomonie – would be ridden with the green chaos of downed ashes and maples, and the buzz signifying their removal. The power outages may depend on location; development in the decades since has emphasized underground lines, reducing susceptibility to dangerous gusts. Conversely – and optimistically – we would again see that spirit of cooperation among the people affected by such an episode of severe weather. We often see this happen with other weather incidents and disasters around the country, and our instincts to help the folks next door will kick in. We might even have an excuse to leave our phones on the counter for several days, useless as they would became sans charging. Perhaps Eau Claire will remain benign weather-wise – getting nailed by any thunderstorm or tornado is a matter of odds. The odds strongly favor some storm striking sometime in the future, maybe in our lifetimes. What is guaranteed is that the residents of our area will work together to help each other, and life will recover and resume. And the robins will sing at 4am. Anthony’s book, Spearhead Echo: The Storm of 1980, is available at The Local Store, 205 N. Dewey St., Eau Claire, as well as online at http://lukaslight.com/books.html, where you can find additional media not available in the print edition. He has also created a Facebook group focused on memories and images of the storm and its aftermath at www.facebook.com/groups/SpearheadEchoTheStormOf1980.